This knife and fork steak sandwich is so easy to pull together for weeknight dinners, and delicious enough for more special occasions. 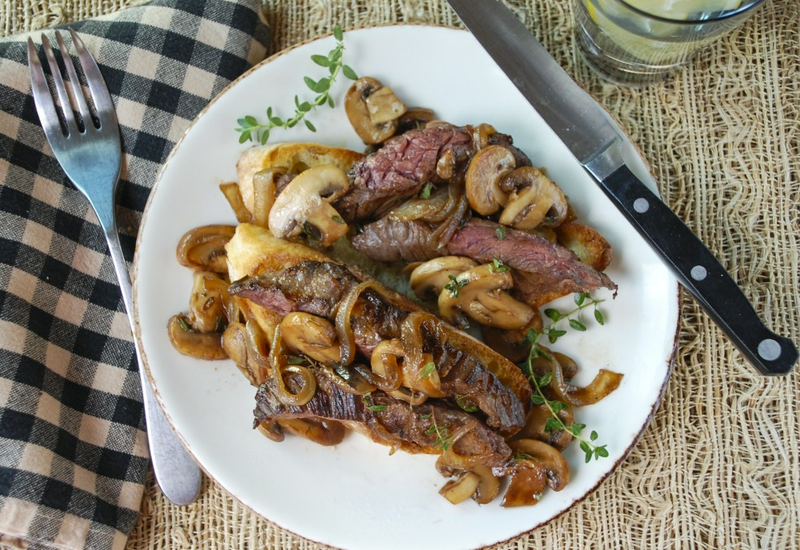 A fast pan seared steak is served over a toasted garlic ciabatta, and topped with balsamic mushrooms with onions! It is a unique 30 minute meal that comes together using only one pan. Think about this for your next Game Day menu as well! If you can't find garlic ciabatta, any ciabatta or crusty bread will do. Just brush the slices with a little olive oil and and rub with cut garlic or sprinkle with garlic powder. This recipe can also make a great party appetizer. 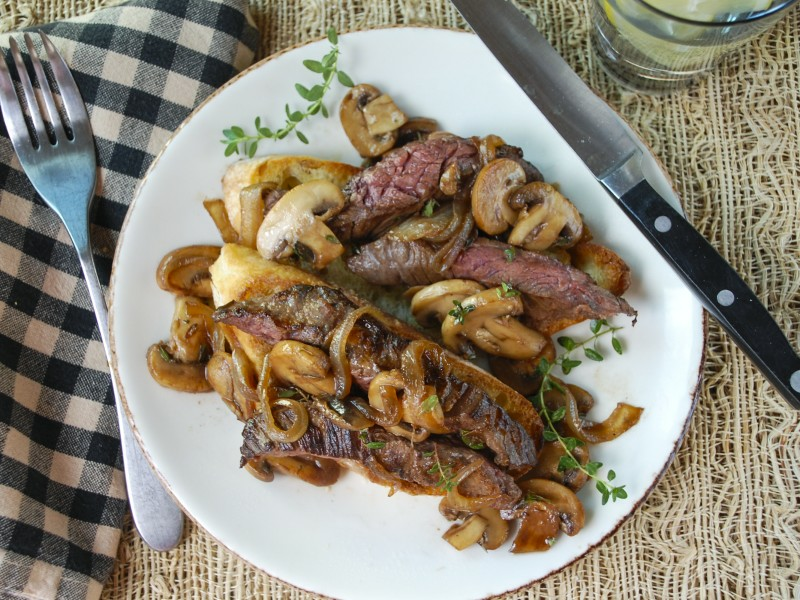 Just slice the steak into small, than strips and served over toasted baguette slices. Per Serving: 364 calories; 20g fat; 12.5g carbohydrates; 32g protein; 104mg cholesterol; 110mg sodium. Made this for dinner and my boyfriend and I really enjoyed this! The steak was cooked just right and I liked the open-faced concept so I wasn't consuming too much bread. I will be making the steak and sauce more often without the ciabatta since I prefer more gluten-free options. This is the perfect steak dinner! The balsamic vinegar and thyme adds exceptions flavor! The meat is tender and when cooked just right, is pink in the middle. Love it! I made this for my husband's promotion dinner and he loved it. It was really easy to make, and super quick. I bought plain ciabatta but added garlic with the onion, mushroom, and balsamic reduction. Very nice dinner and perfect for special occasions. I made this steak in my cast iron skillet and served it with a side salad instead of bread. I added the mushroom mixture back to the pan with the steak at the end, just to heat it through. So good. I made this as an appetizer for some friends that came over, using the tip to cut the steak into small, thin strips and served over toasted baguette slices. It was so delicious, everyone thought I had it catered. I had to show them this recipe online just so they'd believe me that I cooked it myself!